Helsingborg ferries can be booked online with AFerry. Ferries from Helsingborg in Sweden go to Helsingor in Denmark and can be booked quickly and easily on AFerry. 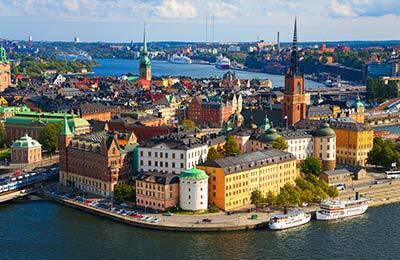 On board a Scandlines ferry you will be able to enjoy a wide range of bars and restaurants. For a quick meal or snack you can go to the self service restaurant or for fine Scandinavian and Baltic cuisine you can enjoy the full service a la carte restaurant. You will also find tax free shops on board where you can pick up a bargain or two. Note, however, that some ferries on very short routes may not offer all of these facilities. Helsingborg Ferry Port is located on the Öresund sound, in Skåne County in the Southern most part of Sweden. Öresund sound is a narrow strait that separates Sweden from Denmark. Helsingborg ferry port is one of the Europe's largest and busiest ports. Its location on the door step of the Baltic Sea has played an important role in its development through the years. The Öresund sound offers an ice free navigable harbour throughout the year making it one of the easily accessible ports. 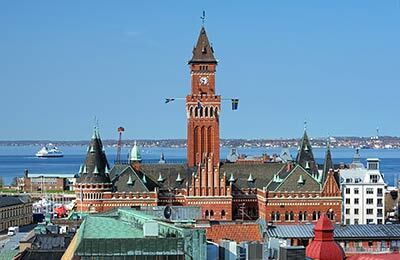 Helsingborg is popularly known as the pearl of the Oresund. It is a beautiful waterfront town with a lot to offer. Helsingborg has a rich cultural life with a lot of historical attractions. Some of them are Kärnan, a medieval tower built as a defence tower around the 12th century, the stately Manor house and parklands of Sofiero, the splendid Kullaberg nature reserve with rich and varied flora rises 188m above the sea level. Helsingborg is a contemporary snapshot of Sweden with many nightclubs and discos, theatres, famous jazz clubs and concerts etc along with some of the finest restaurants along the waterfront walks. There are some excellent shopping facilities on the pedestrian streets of picturesque Helsingborg. If you prefer some outdoor activities, then why not try the fishing tours or diving and surfing in the Öresund or simply relax on the lovely beaches in Helsingborg. Helsingborg Ferry Port is located on the Öresund sound, in Skåne County in the Southern most part of Sweden. Helsingborg harbour is divided into North, South, West and Marina harbours. The Ferry terminal "Knutpunkten" ( in the North Harbour ) which is the combined ferry, train and bus terminal in the city centre is the main terminal for passenger ferry traffic. Scandlines operate from this terminal. Helsingborg ferry port is one of the Europe's largest and busiest ports. Helsingborg Ferry terminal has a wide range of facilities for the passengers waiting to board the Helsingborg Ferries. Free car parking is available outside the terminal but please note that car park is not guarded 24 hours. The important motorways E4 and E6 which connect to all major cities in the rest of Scandinavia and Europe meet here in Helsingborg. Get off the Highway at Helsingborg south and follow signs to "FärjaOslo". There are train connections several times a day to Helsingborg from Hamburg, Oslo, Stockholm and Gothenburg. Also there are local trains available to smaller cities in the region. Swebus operates express bus services to Jönköping, Halmstad, Kristiansand, Gothenburg, Stockholm, and to Copenhagen in Denmark and Skånetrafiken serve the regional and local services.